Therapeutic developments in genetics is quickly becoming a key area of interest for many in the field. 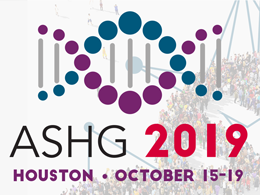 Earlier this month, ASHG co-hosted a webinar with The American Journal of Human Genetics (AJHG) to discuss the process from discovering a genetic mutation for a disease, to developing a therapy. AJHG Editor Bruce Korf moderated, and was joined by two expert panelists Susan Slaugenhaupt, PhD of Massachusetts General Hospital and Harvard Medical School, and Matt Alexander, PhD of the University of Alabama at Birmingham and Children’s of Alabama. Susan presented her work on developing a drug to modify RNA splicing in a rare disease known as Familial Dysautonomia (FD), which has been a 25-year effort. FD currently has no cure, or pharmaceutical treatment, and the only method of care is symptomatic treatment. While the science of the disease is pivotal to discovery, Susan reminds us that the “how to,” for the process is just as important. Below is a timeline showing when her laboratory received the National Institutes of Health (NIH) funding, and how they advanced the translational research project from that point (picture below). Going through the timeline, Susan explained that her team discovered kinetin (6-furfurylaminopurine), a plant growth factor, caused a change in RNA splicing as the amount of kinetin was increased. As Susan’s team continued, they eventually found that while kinetin was not potent enough to act as a drug, it was a good starting point to find new splice modulator compounds. For a complete explanation of Susan’s research and what this discovery meant for FD research, please watch the full webinar. Matt presented on the advances in genetic based drugs for Duchenne Muscular Dystrophy (DMD), and the difficulties in working with neuromuscular diseases. There are several therapeutic approaches to aid DMD patients currently being investigated, however Matt specifically discussed exon skipping drugs, CRISPR, and current gene therapy trials. These efforts, are essentially done in hopes of seeing a partially functional dystrophin protein, which would lessen the severity of the disease. The full webinar further discusses models used to test these approaches, and their possible side effects. Matt additionally noted that when dealing with gene-based therapies for DMD it’s pivotal to have “really good biomarkers and quantification tools to indicate the amount of dystrophin protein being produced,” to accurately show the effectiveness of gene-based therapies. The webinar concluded with a Q&A portion with questions from the audience. To stay up to date on our next webinar with AJHG, follow us on social @GeneticsSociety.